Read Dr. Goldman’s Heath and Wellness Book! When you come to Total Chiropractic Care and Wellness you’ll be treated by Dr. Todd Goldman, who has more than two decades of experience. He began practicing first with his father, before joining our Medford practice in 2002. Dr. Goldman has an expertise in chiropractic adjustment, caring for injuries related to auto accidents and on the job accidents. He is married and is a father of two and is a pilot during his free time. Now he can add another milestone to his list of achievements. He is a published author. Initial intensive or Relief Care: New patients get a complete examination with an emphasis on X-rays and MRIs. Seventy percent of our patients report back or neck pain. Dr. Goldman will examine the results and determine and begin a treatment plan. Rehabilitative Care: This phase occurs after you’ve received chiropractic care and are ready to resume normal activities. You’re still at risk for pain because you have not been specialized and rehabilitative care focuses on building up strength, balance, flexibility, coordination and reducing fear and avoidance of normal activities. Wellness Care: Once you’re done with rehabilitative care, we’ll design a wellness program for you involving things like diet and exercise. “Taking Control” also stresses the care that Total Chiropractic gives for accident victims and people with workplace injuries. Many accident victims suffer from whiplash. The pain from whiplash doesn’t occur right away. We wait 30 days to test whiplash victims. Symptoms include neck pain or stiffness as well as pain between the shoulder blades, arms or legs, feet or hands, headache, shoulder pain or lower back pain. It can even cause brain injuries. Treatment options include chiropractic manipulation and therapy techniques such as trigger point therapy, manual point therapy, and instrument-assisted soft tissue therapy. It’s not just manual laborers who suffer workplace injuries though, many do, often related to lifting. “Taking Control” points out that office workers and drivers who are seated all day can be injured as a result of awkward positioning and restricted movement. Teachers, retailers and others who are on their feet all day are also susceptible to injury. Total Chiropractic will treat all of these injuries. 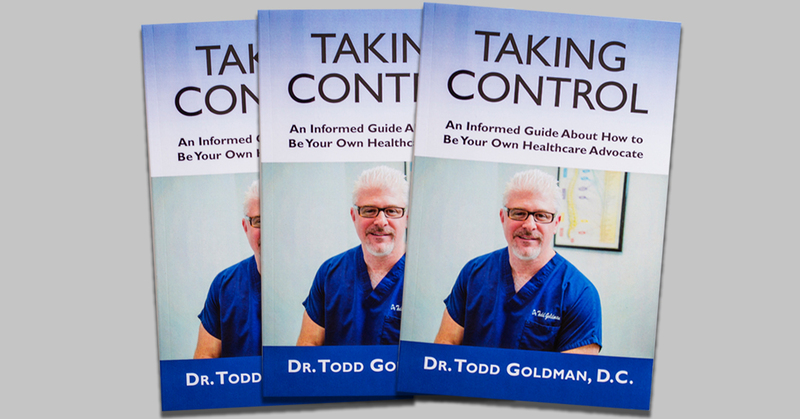 Dr. Goldman’s book goes into a wide variety of treatments including chiropractic adjustments and spinal decompression. It empowers patients to understand what they may be going through and be able to work with their chiropractor on their treatment options. 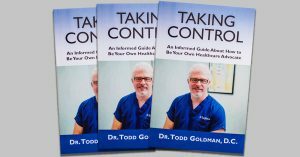 “The rewarding part [of writing the book] is being able to give meaningful information to people from my 23 years of experience in the medical field,” Dr. Goldman says. If you’re concerned about the pain you are experiencing, you can learn your options and pick up this book at Total Chiropractic Care and Wellness. Contact us today.